Annie and her husband didn't part on good terms the night he lost his life in a tragic accident. She's having a hard time to accept what happened. Annie finds out she's pregnant and this makes her even more emotional. Her husband wanted nothing more than to start a family and he would have been an exceptional father. Annie's sister thinks it would be good for Annie to stay in Wales for a while. Peter, who's a co-worker of Annie's sister, knows a secluded country cottage where Annie can get some much needed rest and relaxation. The place is being owned by a sweet old couple and they are planning to take good care of her. Will Annie find the peace and quiet she's looking for? As soon as Annie enters the cottage she feels that she isn't alone. In the beginning she tries to brush it off by convincing herself she's got a vivid imagination, but when a ghost is materializing before her eyes she has no other choice but to believe. The ghost is angry and for some reason it's attacking Annie. Annie needs to protect herself and her unborn child. Will she be able to keep herself safe? Lay Me to Rest is a gripping story. Annie finds herself in a troublesome situation and seeks help to discover why the ghost at the cottage is so mad and restless. Annie is so much stronger than she gives herself credit for and I loved the fact that she doesn't shy away from difficult situations. I was very anxious to find out the reason why the ghost seemed so attached to Annie and this kept me on the edge of my seat. Lay Me to Rest is a creepy ghost story that chilled me to the bone. I actually had to stop reading for a few days because my husband wasn't home. This story scared me so much that I didn't dare go to my bedroom alone. I must have been a detective in a former life, because I always love a good mystery. Sometimes I succeed in cracking the 'case' before I get to the end, but E.A. Clark has included plenty of unexpected twists and turns that kept me guessing all the way to the finale. The eerie circumstances were described vividly, which made it even easier to lose myself into the story. I hope that Lay Me to Rest is the beginning of a brilliant new series, because I can't wait to read more about Annie. If you love to read frightening ghost stories I highly recommend Lay Me to Rest. 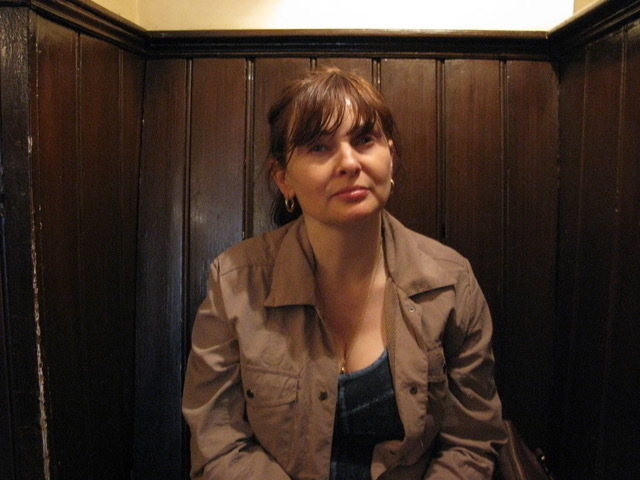 I was born and bred in the UK, in the Midlands, where I still live with my husband and son. I have three grown-up children and five lovely grandchildren. I am happiest at home with my family and pets, but enjoy travelling, and count Italy among my favourite destinations, particularly Umbria where I find the food irresistible – not to mention their best kept secret, the locally produced red wine! In the UK, I love the architecture and vibrancy of Oxford and have long been a fan of the Inspector Morse television series (and the Colin Dexter novels) and its brilliant prequel, Endeavour. My dad is from the isle of Anglesey, in North Wales, and it’s a place very close to my heart. The scenery is breath-taking and it’s a wonderful place to unwind – I find a long walk on the beach very therapeutic – and I always keep my eyes peeled in the hope of spotting any ambergris (solidified whale vomit!) that may have been washed up – highly prized by parfumiers worldwide and the next best thing to winning the lottery – but just as rare! That aside, the whole island is an area rich in folklore and legend, which made it the ideal setting for ‘Lay Me to Rest’. There seem to be ghosts at every turn! I love animals and find the appallingly frequent reports of their ill-treatment really distressing. I look forward to the day when the rights of other sentient beings are taken as seriously as those of humans. I have worked for over twenty years with visually impaired students in mainstream education, sometimes supporting them in class, but in the main producing modified large print and Braille resources so that they have access to the books that their sighted peers can take for granted. It makes you appreciate how precious our vision really is. I was quite a bookworm as a child and loved writing my own stories even then. I started writing short stories and poetry many years ago, and have been runner-up on three occasions in the annual Stratford-upon-Avon Literary Festival writing competition. This spurred me on to try my hand at writing a full-length book. I have self-published a children’s ghost story, but ‘Lay Me to Rest’ was my first attempt at a novel for grown-ups! I like to write about the sort of things that I would want to read myself. I find writing sheer escapism and it is always a pleasure, never a chore. Music – I like a wide range of music, but am a huge fan of David Bowie, and the operas of Puccini. Music has the ability to transport us to another place and time. I think Pennywise – the grotesque clown-faced monster from Stephen King’s IT – is the most sinister thing I can imagine. Not something I would want to come face to face with in a dark alley! I’d be quite well-prepared if a zombie apocalypse were to take place – I’d have a house with a huge cellar, and make that the ‘safe zone’ for my family and friends. I’m not a fan of guns, but wouldn’t have a problem with arming everyone with a baseball bat so that they could protect themselves, in the unlikely event of a zombie or two breaking in. I’d barricade the doors with anything I could lay my hands on and we’d all have plenty to eat and drink for weeks, as my cupboards and fridge are always stuffed to their limits! The movie ‘The Changeling’ – not the Angelina Jolie film of the same title, but the 1980 ghost story starring George C. Scott. It’s the creepiest thing I’ve ever seen and if you haven’t watched it, be warned! Birds in enclosed spaces! I am completely phobic about it – don’t get me wrong, I love birds and as long as they’re outside I don’t have a problem with them. But if one gets into the house I go to pieces! If my book was made into a film, I could see Carey Mulligan playing Annie, as she is a wonderfully expressive actress who could bring an endearing vulnerability and sensitivity to the role, qualities that I can see in Annie. James Norton (a hot favourite for the next James Bond) would be excellent as Peter Roberts, as he is an incredibly versatile actor. He plays such a sympathetic good guy but is chilling as bad seed Tommy Lee Royce in the wonderful BBC drama series ‘Happy Valley’. I can’t wait for the next instalment! I like to write about what captures my imagination. I’ve always been fascinated by the paranormal and the idea of ghosts and spirits – particularly when they communicate, verbally or otherwise, with the living. I used to sit ‘in circle’ at a spiritualist church and heard some very interesting tales, plus had one or two odd experiences of my own, so I believe one hundred per cent that they are ‘out there’. I like to be terrified from the safety of my armchair! 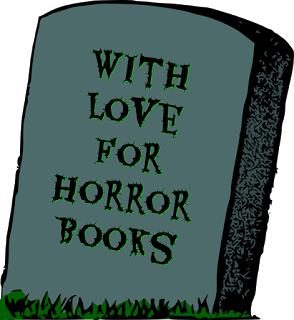 I think that people do love to lose themselves in a creepy plot and scare themselves silly without being at risk of any harm, and that’s why horror is such a popular genre. It’s like a virtual reality theme park ride! My next book, ‘And No Birds Shall Sing’, is to be published later this year by Crooked Cat Books. It’s another ghost story, but with different characters, and darker overtones than ‘Lay Me to Rest’. I intend to write a follow-up to LMTR at some point, as I grew to really like Annie and want to explore what happens to her next. I have a lot of ghosts popping into my head that I need to exorcise on paper! 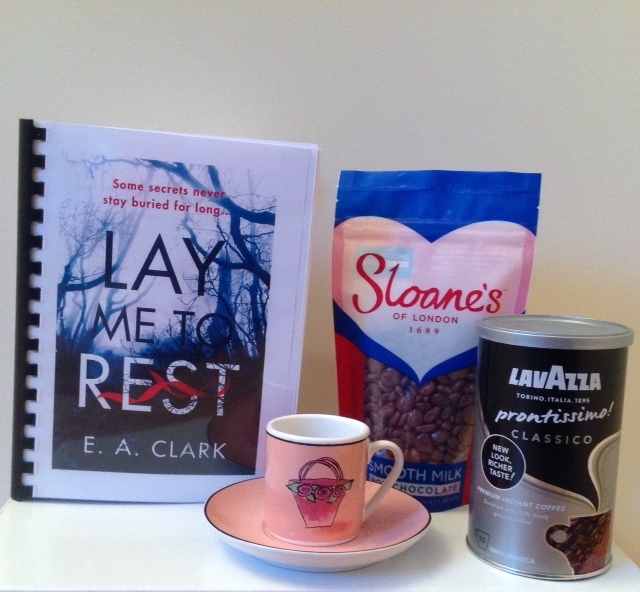 One very lucky reader of With Love for Books will receive a signed print copy of Lay Me to Rest, four espresso cups with saucers, coffee and hot chocolate. Oh this is a story I will enjoy very much. Great post. 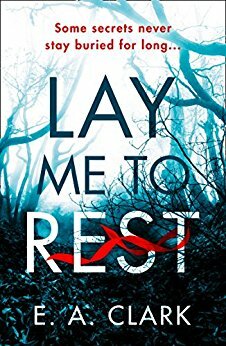 Lay Me To Rest sounds like a gripping paranormal thriller with jaw-dropping twists and turns, heart-pounding intrigue and terrifying plot twists which makes for compulsive reading. I would love to read a gripping story about a ghost at a cottage! Neat! This sounds like a really frightening story, can't wait to read it. This sounds like a heart-racing read and a book that can't be put down. It sounds like a really good book that I would love to read. This looks so gripping! Will definitely be putting this on my must read list! Pennywise is terrifying! Actually, the whole concept of clowns is pretty creepy! This looks like an absolutely fantastic read and creepy. Not sure I could read it when the hubby wasn't home though lol. This sounds like an intriguing story, I will enjoy it. I like ghost stories, sounds like a good book. Whenever I see a cover with a title like this, I'm sold. I have to read and have to own it. This sounds wonderful an spooky maybe one i dont read right before bed! I'm impressed with how well prepared you'll be for a zombie apocalypse. You've really thought this thru. Ooh I really want to read this one. I agree with E A Clark, Pennywise is the scariest thing I can imagine. I would like to give thanks for all your really great writings, including Lay Me to Rest. I wish the best in keeping up the good work in the future.